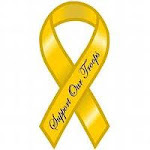 I've scheduled my post today as when it publishes I will no doubt be yawning my head off day dreaming of Kit Kats & coffee while I am attending an epilepsy training refresher course, & I've a feeling it's going to be a long seven hours. I just hope the trainer has a nice voice that keeps us interested and not one that just drones on or I really will switch off & be day dreaming of chocolate lol. The gorgeous resin tree is by Melissa Frances and I picked it ages ago in a DT spend & put it in a safe place, so safe that it has taken me months to find lol. 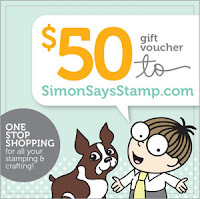 Don't forget to visit the SIMON SAYS STAMP STORE BLOG peeps for inspiration, candy and lots of lovely new or featured products. I also have a card to share which I made last week & forgot I hadn't blogged until I discovered the photo's on my camera earlier. 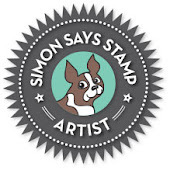 I've used some of Simon Says Stamps gorgeous new exclusive products on this card & I made it Colm for the young man hubby keyworks who gives me strict instructions exactly what he wants on his card each year lol. The new Simon Says Stamp products on this card are the lovely clouds and the happy birthday sentiment stamps. 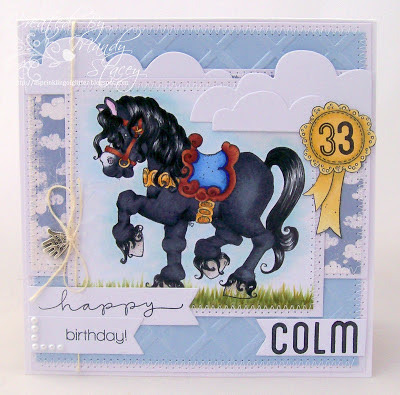 Colm's name & age have also been stamped using other exclusive stamps, all goodies can be found linked at the end of my post. My craft room is driving me mad at the moment as I need to be more ruthless in sorting out & selling on some stash. I like neat and tidy & in such a tiny room I am now even running out of floor space & I'm not relaxing in there as I can't stand the clutter so drastic action must be taken or I won't even be able to get in there soon lol. Seriously it's lovely having my own little space even if it is only 7ftx7ft & I share with a three and a half foot chest freezer but the strip of carpet that isn't covered in furniture or storage boxes & baskets is getting narrower & narrower I'm going to have to learn how to levitate to reach my desk before long lol. Absolutely stunning Mandy with gorgeous colouring, design and textures. Ha! I have the same problem Mandy, i just can't seem to get my craft room cleared of excess stash but i'm going to have to try much harder, lol!! Gorgeous cards Mandy!! wow wee your cards are stunning.. love all the amazing detail on both of them..
thanks for having me this month.. it was fun.. These are both just beautiful! I am LOVING that tree on the first card! What a beautifull christmascard! You never have enough of them. Love the colours you've used. The tree is indeed lovely! Your other card is gorgeous as well! It's never to early to start making Christmas cards and I don't think you can ever have too many of them. Yours turned out beautifully. I love the colours! Hi Mandy, love your card hun. Tilda is gorgeous and the colour and details are fab. Love the tree. 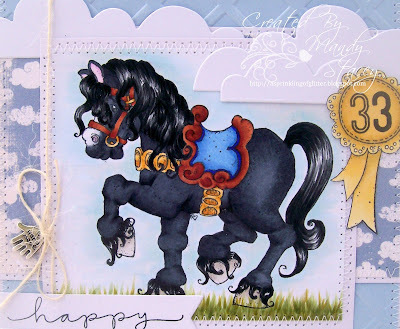 Your second card is fab too, the horse is coloured beautifully. Started to clear out my room but got waylaid and it's as bad a ever now lol. LOVE your card for this week, Mandy that resin tree is perfection! What a special Christmas card! Beautiful card!Love your colors,your coloring is awesome!!! Oh WOW Mandy two stunning cards. 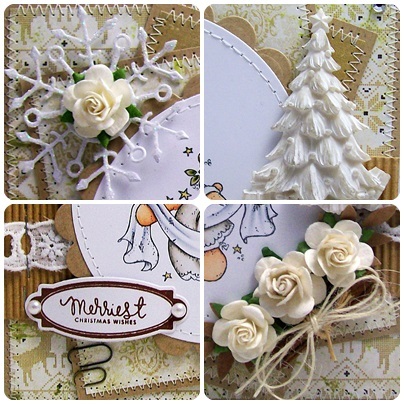 Such a pretty layered card - love the neutrals for Christmas! you have added to Tilda...really stunning as always!